The Bears played pretty evenly with the NFC South-leading New Orleans Saints on the road, but a series of missed opportunities (helped by one atrocious call by the officials) cost them the chance to enter the bye at 4-4. Perhaps most important to Chicago going forward, the loss was a costly one for the Bears. Four starters left the game with injuries and did not return, including guard Kyle Long (hand), center Cody Whitehair (arm), cornerback Bryce Callahan (knee), and tight end Zach Miller (leg). We’ll wait to see how serious the injuries are, though I can say fairly confidently that Miller’s gruesome leg injury means his season (and likely his career) is finished. Still, the best news to me from the game was that they kept fighting. When they went down 17-6 early in the 4th quarter, I expected them to roll over and quit, but from that point on the defense forced two turnovers, the offense scored a touchdown, and the special teams picked up a big return to keep Chicago in the game. The attitude on the team is changing, and the importance of that can’t be overstated. The Bears were forced to ask for a bit more from rookie quarterback Mitchell Trubisky this week, and we saw some of both good and bad, as should be expected from a young quarterback. We saw the talent leading to some big plays, and we saw the rookie mistakes leading to missed opportunities and/or negative plays. The overall stat line (14/32, 164 yards, 0 TD, 1 INT, 46.9 rating) looks ugly, but his performance was not that bad. Notably, Trubisky threw 2 touchdowns, but one of them was taken away by a terrible officiating call and one of them was inexplicably dropped by a wide open Jordan Howard. The aspect of Trubisky’s performance that concerns me the most was the sheer number of missed throws. He overthrew or underthrew too many passes after making the correct read. I fully expect Trubisky to struggle some mentally, but poor accuracy is not something that can be blamed on being a young quarterback. On two particularly egregious examples, Trubisky missed a wide-open Tarik Cohen down the field on a play that might have been a touchdown and underthrew an open Dion Sims deep, turning a big gainer into a near interception. Then he had a missed throw to an open target on the game-ending interception as well. Once again, I have to take some umbrage with the offensive play calling, as they too often fell into predictable patterns. There were too many runs into loaded boxes on 1st and 2nd down, resulting in too many 3rd and longs, which the Bears predictably struggled in. Then late in the game, they had 3rd and 4th and 1 and didn’t even try any play action. What’s the point of pounding Jordan Howard into a 9-man box all game if they’re not going to use that threat to get easy yards down the line? The play calling was especially atrocious in the red zone. Twice in the 1st half the Bears moved into scoring range by mixing up the run and the pass, only to stall the offense by getting predictably run-happy. The 1st time, 1st and goal at the 6 turned into 3rd and goal at the 8 thanks to two play calls everybody in the stadium knew were coming, and the run-run-pass on 3rd and long look just before halftime cost the Bears 3 crucial points when Connor Barth shanked yet another field goal (more on that later). Chicago’s coaches clearly don’t care that the offense is most effective when they mix things up; when they get into scoring range, the priority seemingly shifts from moving the ball to avoiding a turnover so they can make sure to at least attempt a long field goal with a notoriously unreliable kicker. That approach makes perfect sense to me. It was another strong effort by Jordan Howard on the ground in difficult situations. He ran the ball 23 times for 102 yards, buoyed by a big 50 yard run from the shadow of his own end zone. Chicago keeps running him into 8-9 man boxes expecting the run, and he keeps fighting for every yard that’s there, then breaking off a huge run periodically. His efficiency stats can’t be very good right now, but Howard has run well. You can’t say the same about his efforts through the air, as Howard dropped a walk-in touchdown that hit him between the numbers without a defender near him for the 2nd time this year. WR Tre McBride had something of a breakout game, catching 3 of the 4 balls thrown his way for 92 yards. If he can continue to at least be moderately productive, the passing game could improve when the newly acquired Dontrelle Inman replaces the useless Tanner Gentry (1 target, 0 catches) in the starting lineup. The loss of tight end Zach Miller cannot be overlooked for this offense. He was their best and most-reliable pass catcher, a title that now transfers to 5’6″ rookie running back Tarik Cohen (until Inman hopefully takes the mantle). This also opens the door for rookie Adam Shaheen to increase his playing time, though it’s worth noting Daniel Brown played over him in passing situations late in the game. Shaheen got his 2nd target of the season in the red zone in the 1st half, but was unable to get to his spot against a safety who was significantly smaller than him. Speaking of Cohen, Chicago’s usage of him continues to evolve. He carried the ball 4 times, received 3 pass targets, and returned both punts and kickoffs. It was a mixed bag overall, but he did score his 1st career rushing touchdown (when the Bears finally ran out of a shotgun look, something I’ve been asking for all season), had a big kickoff return, and was wide open for a large gain (and potential touchdown) in the passing game, but Trubisky misfired on the pass. It feels like the Bears are finally figuring out how Cohen should be used. He’s a complementary weapon who needs limited touches but can make a few explosive plays per game. Credit to the offensive line for playing a pretty solid game in a tough road environment despite losing 2 of their 3 best starters. They provided pretty good pass protection for Trubisky, and only picked up one pre-snap penalty in the notoriously loud Superdome. Chicago gave up a touchdown to the Saints on the opening drive of the game, which almost always results in a loss for the Bears under John Fox. Sure enough, that’s exactly what happened. Credit to the defense for a quality effort on the road against one of the best offenses in the NFL. They didn’t dominate like they had the last few weeks, but they held New Orleans in check, kept battling, and even forced a few turnovers by a notoriously turnover-stingy offense. This is absolutely one of the top defenses in the NFL. Credit ILB Christian Jones with another quality day. The 4th year player started the season as Chicago’s 4th ILB, but two injuries forced him into play and he has more than held his own. He provided quality coverage and run defense all day, forced a fumble, and came close to forcing another one. Another young player who pieced together a 2nd quality game was 2nd year DE Johnathan Bullard. He had a key forced fumble late and made some other nice stops against the run. After a great training camp and start to the preseason, an injury slowed Bullard for a while, but he seems to be rounding into form and breaking out in the way many expected this year. 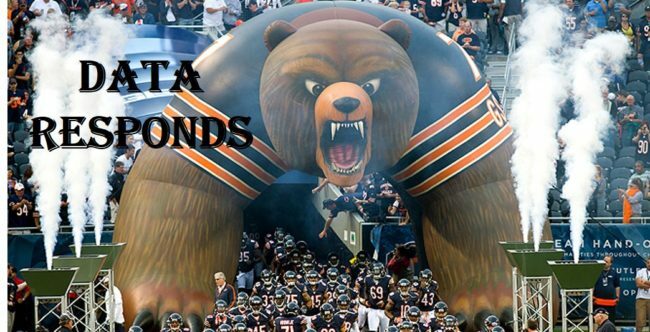 That makes an already scary defensive line even better for the Bears. Another week, another sack by Akiem Hicks. That makes 7 through 8 games, a wow number for any defender, much less a 3-4 defensive lineman. Hicks should find his name on many midseason all-pro teams in the next few weeks, and honestly should be in the conversation for defensive player of the year right now. 2nd year OLB Leonard Floyd continued to bounce back from a slow start to the season, picking up his 5th sack and nearly forcing a Drew Brees fumble on another play. Between Hicks and Floyd, the Bears have two big-time playmakers in their front 7. One area where Chicago’s defense struggled some today, especially early, was open field tackling. There were a few too many big plays in the first half where a player in the back 7 missed a tackle. New Orleans’ offense does a great job stressing defenders by isolating them in space, and Chicago was not up to the task early on. To their credit, they adjusted nicely and held New Orleans to only 6 points (3 coming off of a turnover) after halftime. Another week, a few more key special teams mistakes. On the game’s first drive, Kyle Fuller lined up offsides on a Saints field goal attempt, giving New Orleans a 1st and goal, which promptly turned into a touchdown. Later in the game, Connor Barth missed a 47 yard field goal, making him 7 for 11 on the season. Barth is 3/7 beyond 40 yards, and only 2/5 from 40-49 yards this year. The mediocre journeyman never should have been brought back after a mediocre 2016 season, but something will be seriously wrong in Halas Hall if Barth is still a Bear coming out of the bye. Credit the special teams for a big return late in the game that gave the offense one final chance to tie. Tarik Cohen was returning kickoffs for the first time this year, and he finally took one out of the end zone, with excellent results. Cohen’s speed and shiftiness gives the potential for a big play with good blocking. Wow, that was ugly. When Zach Miller incredibly held on to a one-handed catch while breaking his leg, the NFL somehow overturned the touchdown despite not having a single replay angle that even suggested the ball had touched the ground. You’re supposed to need indisputable evidence to overturn a call, and there was nothing to even say the original call might have been wrong. That was absurd. There were also 4 near-fumbles by the Saints that were ruled down by contact or an incomplete pass. I’m sure plenty of Bears fans will point to at least one of those as additional officiating mistakes, but I think they were all correct, just bad luck for the Bears. In the fourth quarter, they finally did force and recover 2 fumbles. Late in the game, the refs handed Chicago a gift when they called a phantom face mask on New Orlean’s defense, giving the Bears 1st and goal at the 1 yard line. It was a frustrating loss for the Bears to end the first half of the season at 3-5. The record isn’t great, and they very likely aren’t going to the playoffs this year, but the 2nd half of the season should be very fun. There are a plethora of exciting young players to watch on both sides of the ball, including a talented rookie QB who should continue to get better. For the first time since 2013, there is real hope in Chicago.